What are the most common medical malpractice claims filed against internists? Which ones have the most chance to be paid? Which ones are the most expensive? A study published yesterday in JAMA Internal Medicine and led by Sandeep S. Mangalmurti, MD, JD, from the Bassett Heart Care Institute in Cooperstown, NY uses data from the Physician Insurers Association of America to analyze 250,000 lawsuits against internists that have been closed between 1985 and 2009 to answer these questions and others. 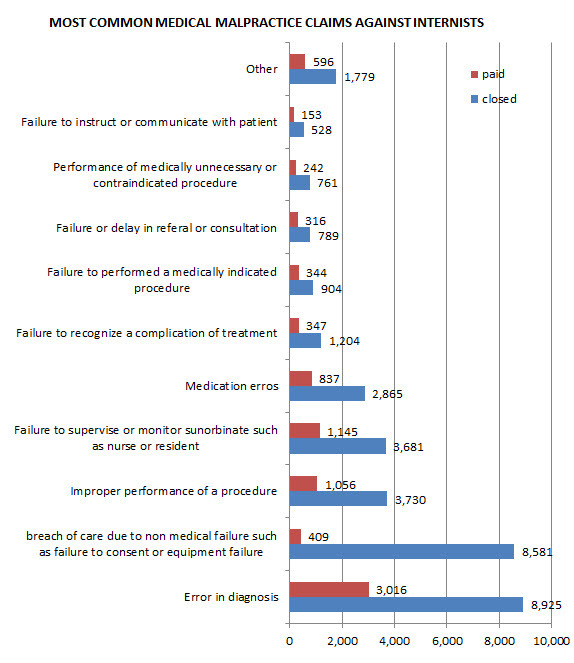 Diagnostic errors represent 26% of all closed lawsuits against internists, 36% of all paid claims and 43% of the total amount paid for medical malpractice by internists. 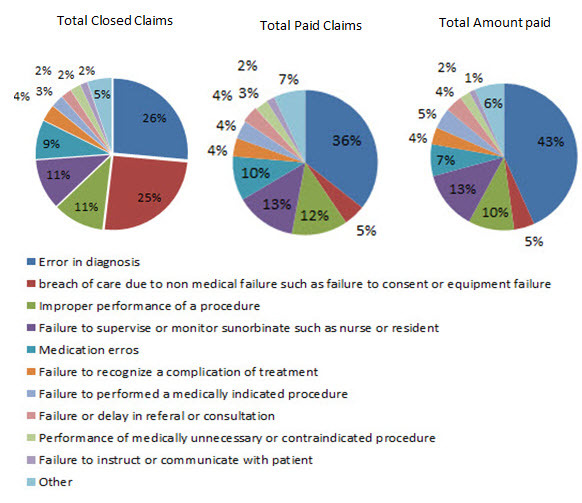 Among the 8,925 closed claims only 34% of them were paid. The study also highlights that most frequent diagnostic errors claims are error in diagnosing lung cancer, myocardial infarction, colon cancer and breast cancer. The second most common type of claims filed against internists are medical malpractice claims not related to a medical error but to a breach of care such as a failure to obtain consent or failure of medical equipment or other. 95% of these claims are rejected therefore even though they account for 25% of all closed claims they only represent 5% of paid lawsuits and 5% of the total amount paid toward internists medical malpractice claims. Approximately a quarter of the claims closed and paid are related to failure to supervise and monitoring subordinates such as nurses or residents as well as claims related to medical procedures not properly performed. These types of claims represent respectively 10 and 13% of the total amount of the lawsuits payments. Medication errors come just behind followed by failure to recognize a complication in the treatment, failure to perform a medically indicated procedure, failure or delay in referral for consultation, performance of unnecessary procedure and failure to instruct or communicate with patient.